It seems that I still have a few friends here in Virginia who don’t know that I curled. This is less a factor of me being modest and unassuming, and more of a factor that I increasingly blot out entire chapters of my life (most of them spent in North Dakota). But, I could sweep, although I would often get so engrossed in my sweeping – back-forth-back-forth-back-back-forth-forth – that I wouldn’t hear the thrower or skip yelling directions to us sweepers down past the hog line. The Olympic curlers are so loud they’ve been heard outside the Sochi arena barking orders to their sweepers. Photo by: Otchampery via Creative Commons. There are no photos of me curling, so stop asking. I looked forward to curling days in high school gym class. If it was basketball or volleyball day, it was simply an hour in the gym running around or getting whacked by the bigger, more athletic girls. We played indoor soccer in the gym, too. That was more fun, and occasionally the tough girls would kick their rivals hard in the legs intentionally, and then blame the ball for the accident. You thought I was kidding about the “Satan” thing in yesterday’s post? Shuttling a bus load of high school students to the curling rink … and back … absorbed a good amount of the school day, or at least the daily gym requirement. Ergo, curling was great. And, every four years, come Olympics time, I have to defend the sport (and, yes, non-believers, it is harder than it looks, and it is a sport). 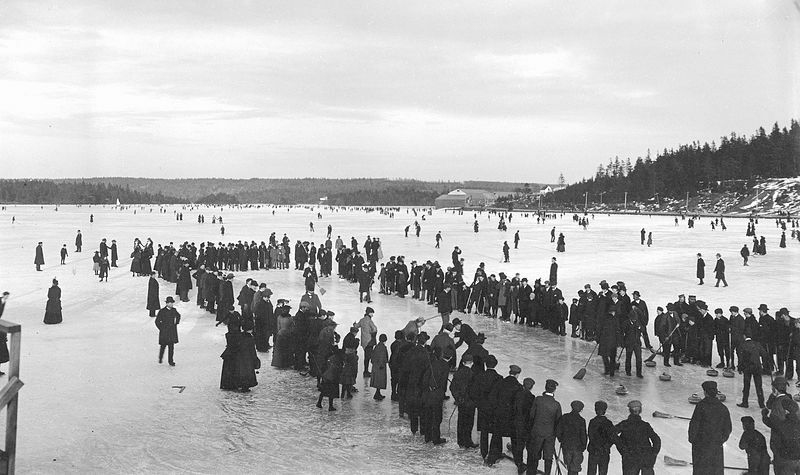 Curling on a frozen Nova Scotia lake in 1897. Look how popular it is! As a public service, here are five things you should know about curling. 5) That ice is not smooth. At the elite, Olympic level, they manufacture an uneven icy surface – known as the sheet – by spraying water on it. At the beer-drinking levels of the sport, the ice just gets dinged up and scuffed on its own. 4) Curlers wear special shoes. Sweepers today have special slip-slidey shoes that have Teflon soles. The thrower wears one Teflon shoe (on his front foot) and one non-slip-slidely shoe on his back (hack) foot. While novice curlers can get cheap “slip-on” soles to turn their normal-people shoes slidey, Olympic curlers will pay upwards of $450 for the perfect curling shoe. 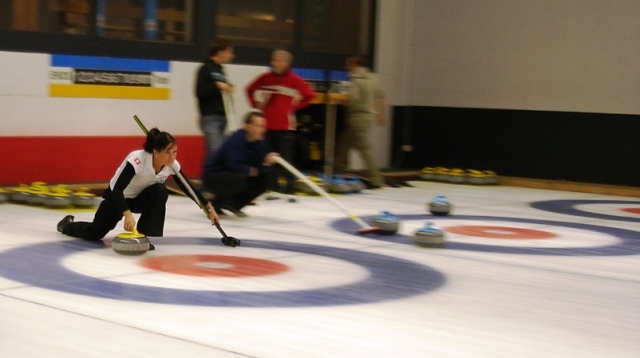 3) The word “curling” has nothing to do with the movement of the rock. If the Ramones had curled, I’d have Olympic medals by now. This is one of the greatest, most beautiful, and most underused words ever. Please use “bonspiel” in conversation today. Now, go watch curling … and impress your friends! This entry was posted in Life and tagged curling, North Dakota by Jackie, The Baseball Bloggess. Bookmark the permalink. Just finished reading the Wikipedia entry on curling as I couldn’t figure out the scoring while watching it on the Olympics. Now I also know the difference between brooms and brushes. I think I miss the brooms, though the players likely don’t. Love this… Curling has always fascinated me so I grealty appreciate your “lesson”. Thank you!! Thank you, Elizabeth … I’m told there’s a curling team in Charlottesville … maybe we can rustle up a Virginia Bonspiel! Many thanks for stopping by, Harold … so nice to have you in my orbit!